In order to know which graphical tile we need to render for a particular space we need to somehow take a look at the spaces around it. Now this could be accomplished by lots of if or case statements but using a little math it’s much easier to handle. 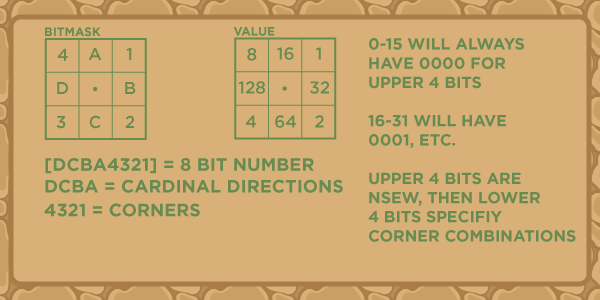 We’re using a 4 bit number to create a hash for each space that identifies what the tiles around it look like. If the space has a value of 14 that means there is no tile above it but one to it’s left, one to it’s right and one below it. 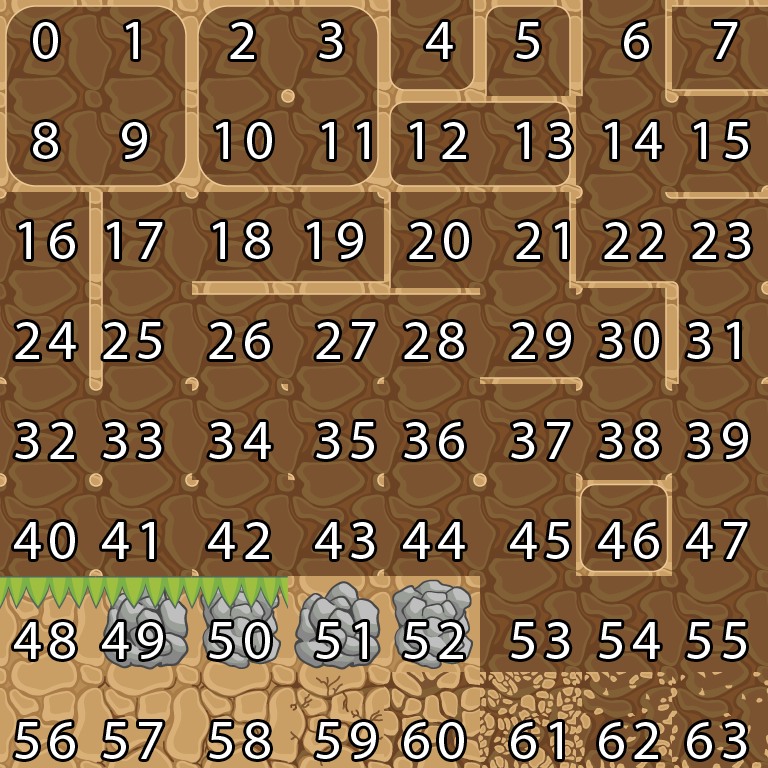 This will always be the case for a tile of value 14, and all tiles in this situation will have a value of 14. Once we have this value, you know which graphic tile it needs and if you designed your graphics well it will all fit together for any combination. The graphic set I made here is just designed to illustrate which of the 4 sides have a connection and which don’t. 1. I made the tilemap art in the way that was easiest from the art side, not the coding side or the order is all over the place. 2. We need to somehow map the 256 possibilities to the correct 48 graphic values. Both of these problems can be dealt with at the same time by using a look-up table. The job of this look-up table is to map from 0-255 -> 0-47 depending conditionally on the corner pieces. You can implement this however you want, probably an array where the indexes 0-255 correspond to the result of the bitmasking and it spits out the graphic tile value 0-47. So, first lets talk about the bitmask we’re going to use for the 8-bit case. You can see how some bits have an X instead of 0 or 1. These are the corners that don’t matter for that particular base case. The “Lower Bits Sum” column shows all values that row accounts for when you do all combinations of 0 and 1 for any x’s. 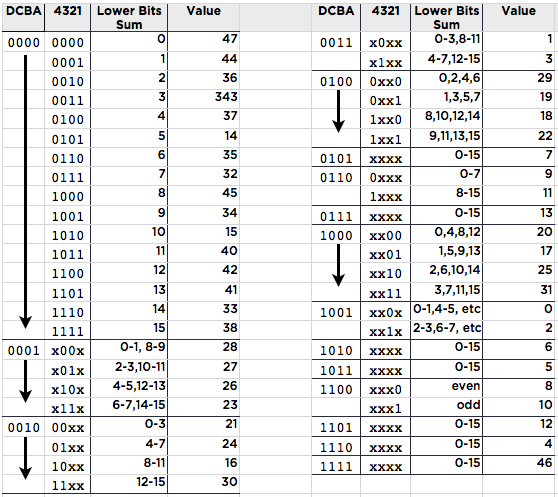 Hopefully this table makes sense, the first 4 numbers (including x’s) give the 0-256 value that results from bitmasking and the final value column is the index on the tileset graphic I posted above. You can see they are all out of order because like I said I made them before really thinking about this. Hopefully this helps people if you need to use something like this in the future. It’s not too complicated once you lay it all out and it’s much easier and cleaner than having all kinds of branching and crazy logic in your code. This entry was posted on Thursday, April 28th, 2011 at 5:17 pm	and is filed under iDevBlogADay. You can follow any responses to this entry through the RSS 2.0 feed. Both comments and pings are currently closed. Very useful – thanks for taking the time to write it up! Great post! Thanks for sharing this info. It’s always fun to see how a bit of logic and math can condense a complex problem.